Autograph Intelligence Lenses Offer the Best in Vision Technology! Until now, progressive lenses have been designed to provide the same visual solution no matter what your Visual Age™. However, research has shown that your visual behavior changes in correlation with your Visual Age™. Visual Age™ refers to the physiological age of the eye (the required reading power) and is generally correlated with your chronological age. Harnessing today’s cutting-edge technologies, Shamir Autograph Intelligence™ is the first progressive lens to integrate patient experience, daily visual behaviors and elements of artificial intelligence, to take into account the diversity of your daily visual needs. Vista Eye Care is proud to offer the Shamir Autograph Intelligence™ lens design as our top-tier premium progressive addition lens. 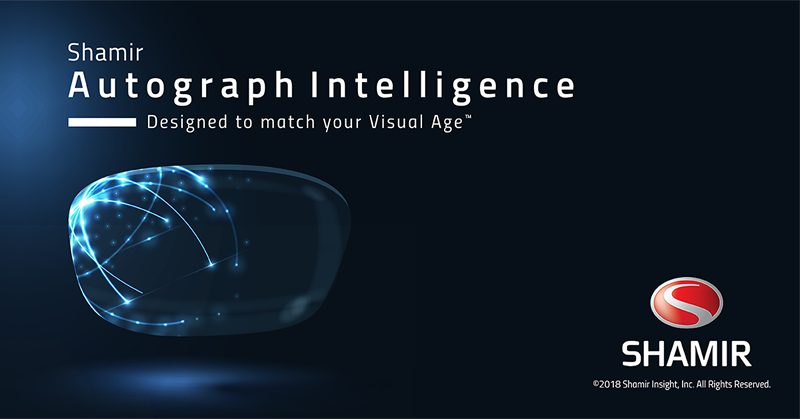 Shamir Autograph Intelligence™ provides you with a solution that is unique, and optimally suited to your visual behavior and Visual Age™. No appointment is needed to browse our extensive frame collections and to speak with an optician about how Shamir Autograph Intelligence™ can help you see clearly at all distances. Make this Spring the time that you invest in the quality of your vision with Shamir Autograph Intelligence lenses. You don’t need an appointment to speak with one of Vista Eye Care’s opticians about your eyewear – stop by any time! If you haven’t had your annual eye exam yet, call us today at (303) 450-2020 or use the button below to schedule online.